Mission: The 4-H program is all about people sharing, doing, and learning together in all kinds of projects, events and activities through local clubs, special interest clubs, school-based and after-school programs and individual memberships. 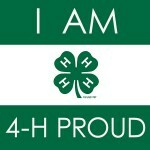 Supporting the 4-H program through Warren Gives provides opportunities to the 250 youth active in the county. Donations are used to purchase club supplies and educational materials. Members attend camps, clinics, and workshops at reduced rates through the many donations received from Warren Gives. Current Projects/Needs: The Warren County 4-H program in-conjunction with the Warren County Fair Association will use a portion of the funds raised through Warren Gives to support renovations at the fairgrounds in Pittsfield, Pennsylvania. The two programs have ambitious goals of placing a permanent structure over the bleachers at the main ring on the fairgrounds. The structure will provide shelter from inclement weather and offer handicap accessible views of the events taking place in the ring. Additionally the two programs will focus on equipment to properly groom the ring and a water system to keep the footing stable. Any and all support is truly appreciated by the 4-H program and the Warren County Fair Association.